Robyn (DForenPsy student) discusses visiting a therapeutic community at HMP Grendon. Recently, I attended an optional open day at HMP Grendon therapeutic community in Buckinghamshire. This was not a requirement of the Doctorate in Forensic Psychology, but one of many learning opportunities that the University of Nottingham encourage students to attend. Admittedly, I have not always made the most of these great opportunities. With my focus being firmly on balancing the competing demands of this challenging yet rewarding course. That said, I would strongly urge future students to set aside the time to attend this annual event. HMP Grendon is a Therapeutic Community (TC). Instead of the traditional hierarchical model, the prison runs as a democracy. The prisoners are referred to as ‘residents’, and are given greater responsibility for their own rehabilitation and running their community. Consequently, the residents were more empowered and there were lower levels of adjudications and self-harm incidents. The open day was highly informative and all staff and residents were welcoming. There were talks on how the TC was run, outcome measures, and personal reflections from staff. However, the most impactful sessions were delivered by the residents themselves. In the morning some of the residents acted in a play which depicted the main character JJ’s journey from mainstream prison into the TC. The play was largely based on improvisation which gave more depth to individual characters as they expressed their personal struggles and experiences through drama. This very emotive production illustrated how difficult it was for the residents to open up and trust members of the community, after years of hiding their emotions and adhering to traditional prison and male stereotypes. Additionally, there were talks from individual residents who relayed their personal stories and reflections from their time in the TC. As I sat and listened to these stories I reflected on how hard it must be for the residents to share these experiences to an audience of over 150 strangers. In that moment I felt privileged to be hearing these stories. 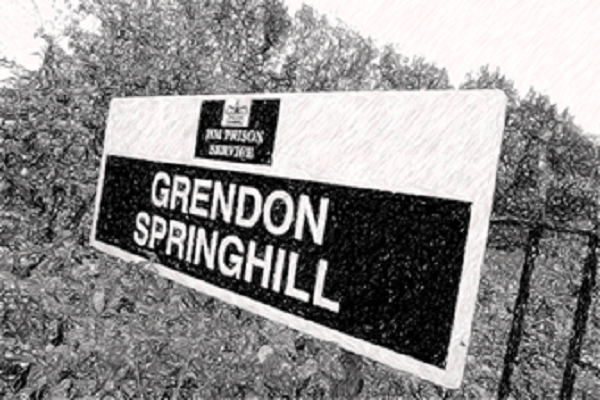 My thoughts turned to my clients on placement, and the similarities between them and the residents of Grendon. It suddenly hit me, I have been so focused on seeing change and achieving outcomes that I have forgotten how much progress each client makes just by sharing their stories. I will try and bare this in mind during my future practice, particularly when working with clients who seem to be making slower progress. Finally, the experience of visiting HMP Grendon has shown me that there is another way to rehabilitate offenders within prison, which gives me greater hope for the future of our prison service. Visiting Grendon is a brilliant opportunity for our students – thanks so much for welcoming them!